Good nutrition is vital for your canine’s health and now, thanks to Darford, even your dog’s treats can be both healthy and delicious! To ensure that Darford is known as the top baker in the industry, raw materials are sourced from vendors as close to the production facility as possible and only from qualified North American suppliers or growers. The company plant is Federally Inspected by the Canadian Government (plant # CD14), approved for export to the USA by the USDA, and registered as a Certified Organic manufacturing facility by OCIA / Procert. “We can only hope to achieve as humans, what comes so freely from our pets: unconditional love, loyalty and true companionship” Darcy Bomford, Founder and President. Our ingredients set us apart from any competition! Darford biscuits contain whole food ingredients. We prefer to spend more on quality ingredients, rather than cut corners by purchasing by-products. We take pride in knowing that our customers and their pets benefit from our standards. Darford biscuits contain human grade meat from federally inspected and dedicated suppliers. This human grade meat yields a superior product. We feel that it is not only healthier but that dogs will decide it just tastes better. Other ingredients like our smooth and creamy peanut butter for example, is the same peanut butter you use on your toast - and our old fashioned oats are the same oats you make oatmeal cookies with. 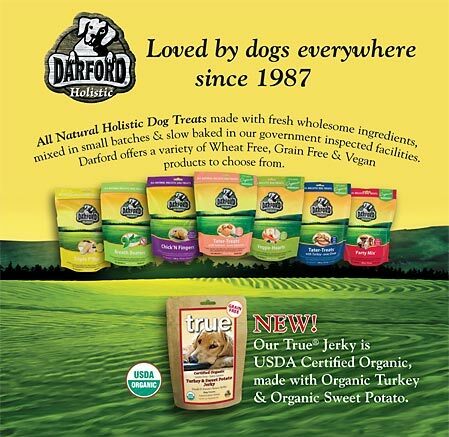 Our newest product, Darford’s True® Jerky, is made with 100% natural products and over 95% Organic Turkey and Sweet Potato, ensuring that your pet receives a completely natural product that they will love. No artificial colours, preservatives or flavours, just True® unconditional love! This product is USDA certified organic. Darford biscuits contain human grade meat and added Organic Ingredients for a healthier and more wholesome treat. We feel that it is not only healthier but that dogs will decide it just tastes better. Look for recipes with Salmon, Chicken, Turkey, Liver, Cheese, and Peanut Butter in Wheat-free, Grain-free, and Vegetarian formulations! This salmon, grain free recipe was baked with wild Alaskan Salmon, rich in omega 3 essential fatty acids. We also added a special blend of certified organic ingredients, including fruits & vegetables rich in antioxidants & ground flax seed containing additional omega 3 fatty acids. This recipe was baked extra hard with parsley & chlorophyll to help keep teeth clean and improve bad breath. We also added a special blend of certified organic ingredients including fruit & vegetables rich in antioxidants & ground flax seed containing omega 3 fatty acids. This line is designed for smaller animals but has the same quality ingredients as found in our original holistic line. Wheat free recipes rich in powerful antioxidants and anti-inflammatory compounds, and are an excellent complementary food for birds and small animals. We also added our special blend of certified organic fruits, vegetables, and ground flax seeds containing omega 3 fatty acids. contains hypo allergenic and low fat formulations. They are wheat, corn and soy free. Veggie hears are a great support for your dog’s skin and coat, as well as being an excellent treat for overweight dogs and if you like this product, check out the Holistic Veggie-Hearts with added organics! Assorted Flavors- Give you Dog some variety with the Assorted pack. Contains cheese, liver, charcoal, and Vegetable flavors! If you like this product, check out the Holistic Party Mix with added organics! What Do Customers Say About Darford Products? I recently was recommended your Charcoal & Peppermint dog cookies after my dog had an upset stomach/diarrhea. I could not believe, first of all, how much she loved the cookies (she wasn't eating her food as she was not feeling well) but most importantly, how much better she got in only 24 hours! I was truly amazed. I was even happier when I read the ingredients and when I found out that they were made in Canada! Keep up the excellent work! I am definitely buying your brand of dog cookies from now on. I love them so much I even recommended them to all the members of the Jack Russell forum web site. Thank you again. I brought the whole range of Darford biscuits home to England from a skiing holiday in Canada one year, especially for my little dog Bubu. She wasn't just pleased to see us come home - she was thrilled and delighted when I opened my suitcase and these delicious, healthy treats came out! She made short work out of all 9 packets, and now I'm thinking about booking another vacation trip to Canada so that I can stock up on her favorite treats! Of course, I might squeeze in some winter sports while I'm there....! Order Your Darford Biscuits Today! Give your dog some delicious treats that you can feed good about! To locate a store nearest you please email contact information and products of interest A Darford representative will be in touch with you shortly to complete your purchase.